entertainment, originally uploaded by jahansell. What do people want at a farmer's market, besides produce? Music! What a "fun" photo and great smile. He does seem to be entertaining you. I like your photo mostly expression the celloist. Priceless. Is it just my imagination, or that one XL-sized cello? 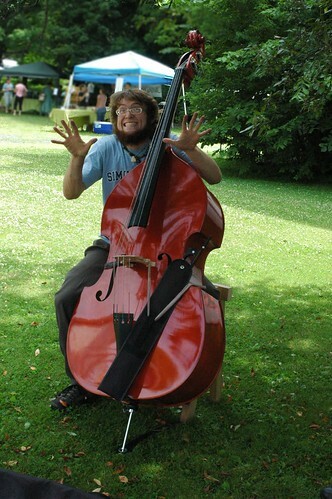 My favorite string instrument, and a well-captured cellist. A lot like the Madison Farmers' Market - musicians on every corner & they don't ever seem to drown each out.